You cannot listen to the pronunciation of pa because your browser does not support the audio element. Chinese character and stroke order animation"How do I write 琶 ( pá ) correctly?" 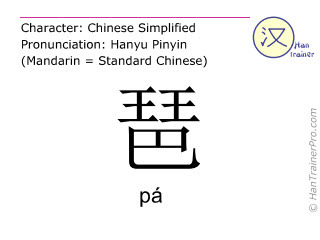 The traditional Chinese characters of pá are identical with the modern (simplified) characters displayed above. 琶 is composed of 12 strokes and therefore is of average complexity compared to the other simplified Chinese characters (average: 13.1 strokes). Learn the 1000 most common Chinese characters with the new Han Trainer Top 1000 Edition vocabulary trainer.